← Queen – Gimme The Prize. 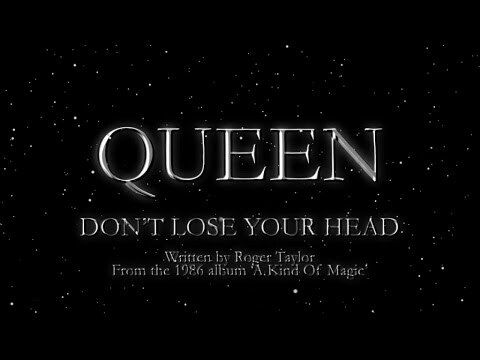 Queen – Don’t Lose Your Head. Publicat pe 6 octombrie 2015	de Cristi M.
Estimates of Queen’s total worldwide record sales to date have been set as high as 300 million. In the UK, Queen has now spent more collective weeks on the UK Album Charts than any other musical act (including The Beatles), and Queen’s Greatest Hits is the highest selling album of all time in the UK. Two of Mercury’s songs, „We Are the Champions” and „Bohemian Rhapsody,” have also each been voted as the greatest song of all time in major polls by Sony Ericsson and Guinness World Records,respectively. The former poll was an attempt to determine the world’s favourite song, while the Guinness poll took place in the UK. Both songs have been inducted into theGrammy Hall of Fame; „Bohemian Rhapsody” in 2004 and „We Are the Champions” in 2009. In October 2007 the video for „Bohemian Rhapsody” was voted the greatest of all time by readers of Q magazine.